My City Sampler quilt top is complete. Getting a picture of this 90" square quilt isn't the easiest thing but I think I managed to do okay. I sashed my 100 City Sampler blocks in a no-name linen-like fabric I found at the Fabric Place Basement. Deciding on the best fabric to sash these blocks was a real challenge: I didn't want to choose anything that would overcome or blend into any of the blocks and I was pretty determined to not redo any of the blocks. I am happy with my choice of this tan textured fabric that shouldn't give me any trouble when the quilt is washed, it is 100% cotton. Sewing all of the blocks into the sashing was definitely tedious but I think I did well at lining it all up pretty neatly thanks to the tips contained in this video on row alignment from Fons and Porter. I chose the gridlock pattern in the book because it does a great job of showing off the blocks- it's simple with no distractions. 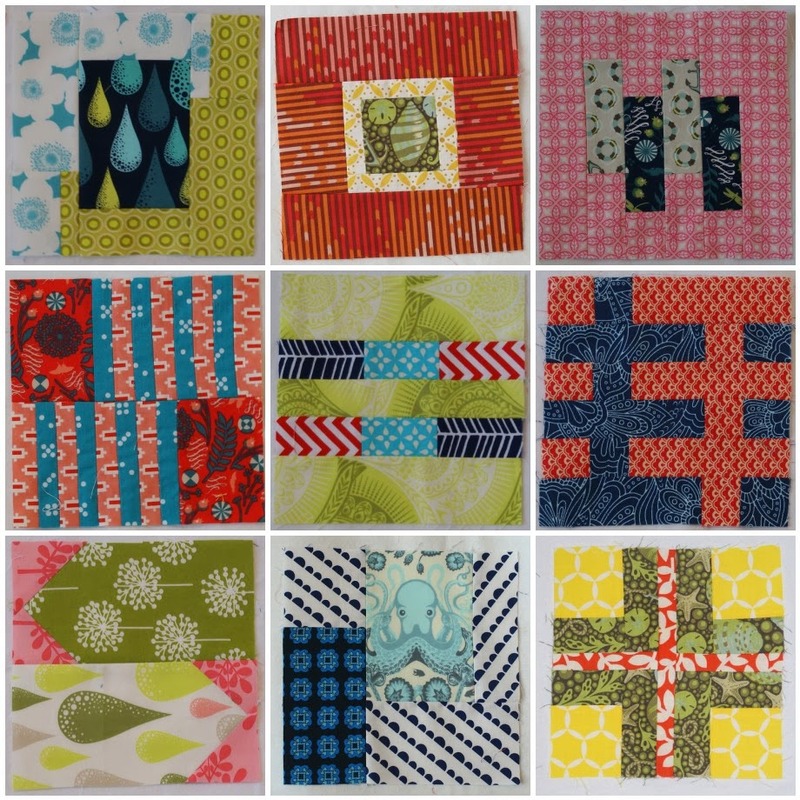 When I layed out the blocks, I decided to not worry too much about orienting all of the awesome motifs to create a "top" to the quilt. I love being able to put a quilt on my bed and not worrying that it is "upside down" or whatever. I paid close attention to dispersing the colors as well as the shapes to achieve balance. Here's a mosaic of some more of my favorite blocks. I had a lot of fun mixing up Salt Water and Prince Charming with my stash. I usually don't do scrappy pieced backs but this quilt simply called for it. It's fun to see the Tula motifs on the larger scale. I also snuck in a scrappy slab made from scraps- I wish I had the time/patience to make the whole quilt back like that, but that's a project for another day. Congratulations, that is awesome. I just got the book for Christmas. Any advice before I start? LOVE the sashing you picked. I think it's the perfect fabric - it pops without being distracting and really compliments the fabric in the blocks. Oh wow! It is awesome! I love the neutral color you used (I am not a white quilt kinda person). And all those Tula Pink fabrics!! Fantastic job on this City Sampler! oh this is lovely and I really like your background. Nicely done!! WOW! this is a stunning quilt. Those blocks are perfectly aligned after the sashing. Love it! You're definitely queen of big quilts! Lovely! Your background color is wonderful; adds warmth without distracting for your gorgeous blocks. Bravo! Wow what a treasure. Front and back are both spectacular.